These highlights do not include all the information needed to use KOÄ€TE ® safely and effectively. See full prescribing information for KOÄ€TE. KOÄ€TE is not indicated for the treatment of von Willebrand disease. Frequency of KOÄ€TE administration is determined by the type of bleeding episode and the recommendation of the treating physician. To report SUSPECTED ADVERSE REACTIONS, contact Grifols Therapeutics LLC at 1-800-520-2807 or FDA at 1-800-FDA-1088 or http://www.fda.gov/medwatch. 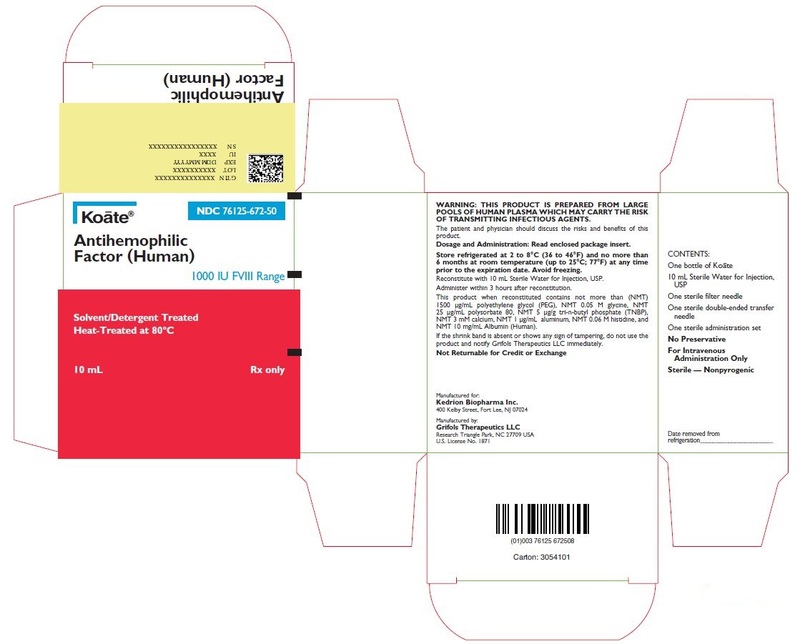 KOÄ€TE® is a human plasma-derived antihemophilic factor indicated for the control and prevention of bleeding episodes or in order to perform emergency and elective surgery in patients with hemophilia A (hereditary Factor VIII deficiency). Dose and duration of treatment depend on the severity of the Factor VIII deficiency, location and extent of bleeding, and the patientâ€™s clinical condition. Each vial of KOÄ€TE is labeled with the actual Factor VIII potency in international units (IU). Calculation of the required dose of Factor VIII is based on the empirical finding that one IU of Factor VIII per kg body weight raises the plasma Factor VIII activity by approximately 2% of normal activity or 2 IU/dL. Patients may vary in their pharmacokinetic (e.g., half-life, in vivo recovery) and clinical responses. Base the dose and frequency on the individual clinical response. A guide for dosing KOÄ€TE for the control and prevention of bleeding episodes (1,2) is provided in Table 1. Consideration should be given to maintaining a Factor VIII activity at or above the target range. (twice daily) Until hemorrhage stops and healing has been achieved (1â€“2 days). (twice daily) Until healing has been achieved (2â€“7 days, on average). Until healing has been achieved for up to 10 days. Intracranial hemorrhage may require prophylaxis therapy for up to 6 months. For the next 7â€“10 days, or until healing has been achieved. Use aseptic technique (clean and sanitized) and a flat work surface during the reconstitution procedure. Bring the vials of KOÄ€TE and the diluent (Sterile Water for Injection) to room temperature before use. Remove the shrink band from the KOÄ€TE vial. Do not use KOÄ€TE if the shrink band is absent or shows signs of tampering, and notify Grifols Therapeutics LLC immediately. Remove the plastic cap from the KOÄ€TE vial (Fig. A) and clean the top of the stopper with an alcohol swab. Allow the stopper to dry. Place the KOÄ€TE vial upright on a flat surface. Remove the sheath from the other end of the transfer needle. While holding the KOÄ€TE vial securely on a flat surface insert the needle into the vial at a 45° angle to minimize foaming (Fig. C). The vacuum will draw the diluent into the concentrate vial. If vacuum is lost, use a sterile syringe and needle to remove the sterile water from the diluent vial and inject it into the KOÄ€TE, directing the stream of fluid against the wall of the vial. Remove the diluent vial and transfer needle (Fig. D). Agitate vigorously for 10-15 seconds, (Fig. E1) then swirl continuously until completely dissolved (Fig. E2). Avoid excessive foaming. The reconstituted solution should be clear to opalescent. Do not use if particulate matter and discoloration is observed. Clean the top of the vial of reconstituted KOÄ€TE with alcohol swab and let surface dry. Attach the filter needle (from the package) to a sterile syringe. Withdraw the KOÄ€TE solution into the syringe through the filter needle (Fig. F). Remove the filter needle from the syringe and discard the filter needle into a puncture proof container. Use KOÄ€TE within 3 hours after reconstitution. Do not refrigerate after reconstitution. Reconstitute each vial using a new transfer needle. Draw up all the solution into a single syringe. Visually inspect the final solution for particulate matter and discoloration prior to administration, whenever solution and container permit. Do not use if particulate matter or discoloration is observed. Attach the syringe to the connector end of an infusion set. Administer intravenously. The rate of administration should be determined by the patientâ€™s comfort level, and no faster than 10 mL per minute. KOÄ€TE is available as a lyophilized powder for reconstitution in single-use vials of 250, 500 and 1,000 IU of Factor VIII activity. The actual Factor VIII potency is labeled on each KOÄ€TE vial. Hypersensitivity reactions, including anaphylaxis, are possible. Early signs of hypersensitivity reactions, which can progress to anaphylaxis, may include angioedema, chest tightness, hypotension, rash, nausea, vomiting, paresthesia, restlessness, wheezing and dyspnea. If hypersensitivity symptoms occur, discontinue use of the product immediately and administer appropriate emergency treatment. KOÄ€TE contains blood group isoagglutinins which are not clinically significant when small doses are used to treat minor bleeding episodes. However, when large and/or frequent doses of KOÄ€TE are given to patients with blood groups A, B, or AB, acute hemolytic anemia may occur, resulting in increased bleeding tendency or hyperfibrinogenemia. Monitor these patients for signs of intravascular hemolysis and falling hematocrit. [see Warnings and Precautions (5.5)] Should this condition occur, leading to progressive hemolytic anemia, discontinue KOÄ€TE and consider administering serologically compatible Type O red blood cells and providing alternative therapy. Because KOÄ€TE is made from human blood, it may carry a risk of transmitting infectious agents, e.g., viruses, the variant Creutzfeldt-Jakob disease (vCJD) agent and, theoretically, the Creutzfeldt-Jakob disease (CJD) agent. There is also the possibility that unknown infectious agents may be present in the product. The risk that the product will transmit viruses has been reduced by screening plasma donors for prior exposure to certain viruses, by testing for the presence of certain current virus infections, and by inactivating and removing certain viruses during manufacture. Despite these measures, this product may still potentially transmit diseases. Report all infections suspected by a physician possibly to have been transmitted by this product to Grifols Therapeutics LLC at 1-800-520-2807. Monitor for the development of Factor VIII inhibitors. Perform a Bethesda inhibitor assay if expected Factor VIII plasma levels are not attained, or if bleeding is not controlled with the expected dose of KOÄ€TE. Use Bethesda Units (BU) to report inhibitor levels. Monitor for intravascular hemolysis and decreasing hematocrit values in patients with A, B or AB blood groups who are receiving large or frequent doses of KOÄ€TE. The most common adverse drug reactions (frequency â‰¥ 5 % of subjects) observed in the clinical trial were nervousness, headache, abdominal pain, nausea, paresthesia and blurred vision. Because clinical studies are conducted under widely varying conditions, adverse reaction rates observed cannot be directly compared to rates in other clinical trials and may not reflect the rates observed in practice. The safety assessment of KOÄ€TE is based on data from a 2-stage, safety, pharmacokinetic (PK) and efficacy clinical trial in which twenty subjects with severe hemophilia A (<1% endogenous Factor VIII activity) were evaluable for safety. Nineteen subjects were enrolled in Stage I of the trial, including 15 Caucasian, 3 Hispanic, and 1 Black subjects. The mean age was 29 years (range: 13.9 â€“ 46.4 years). Nineteen subjects, including the 18 subjects who completed Stage I, and one new subject were enrolled in Stage II. The mean age was 30 years (range: 13.9 â€“ 46.4). The subjects received a total of 1053 infusions. Ten adverse reactions related to 7 infusions were reported in 4 subjects. These were: nervousness (2 subjects [10%]), headache (1 subject [5%]), abdominal pain (1 subject [5%]), nausea (1 subject [5%]), paresthesia (1 subject [5%]), and blurred vision (1 subject [5%]). Subjects were monitored for neutralizing antibodies (inhibitors) to Factor VIII by the Bethesda assay at baseline and at 8, 17 and 26 weeks. No evidence of inhibitor formation was observed in the clinical trial. The detection of antibody formation is highly dependent on the sensitivity and specificity of the assay. Additionally, the observed incidence of antibody (including neutralizing antibody) positivity in an assay may be influenced by several factors including assay methodology, sample handling, timing of sample collection, concomitant medications, and underlying disease. For these reasons, it may be misleading to compare the incidence of antibodies to KOÄ€TE in the study described above with the incidence of antibodies in other studies or to other products. There are no data with KOÄ€TE use in pregnant women to inform on drug-associated risk. Animal reproduction studies have not been conducted using KOÄ€TE. It is not known whether KOÄ€TE can cause fetal harm when administered to a pregnant woman or can affect reproduction capacity. KOÄ€TE should be given to a pregnant woman only if clearly needed. In the U.S. general population, the estimated background risk of major birth defects and miscarriage in clinically recognized pregnancies is 2-4% and 15-20%, respectively. There is no information regarding the presence of KOÄ€TE in human milk, the effects on the breastfed infant, or the effects on milk production. The developmental and health benefits of breastfeeding should be considered along with the motherâ€™s clinical need for KOÄ€TE and any potential adverse effects on the breast-fed infant from KOÄ€TE or from the underlying maternal condition. Safety and efficacy studies have been performed in 20 previously treated pediatric patients aged 2.5 to 16 years. 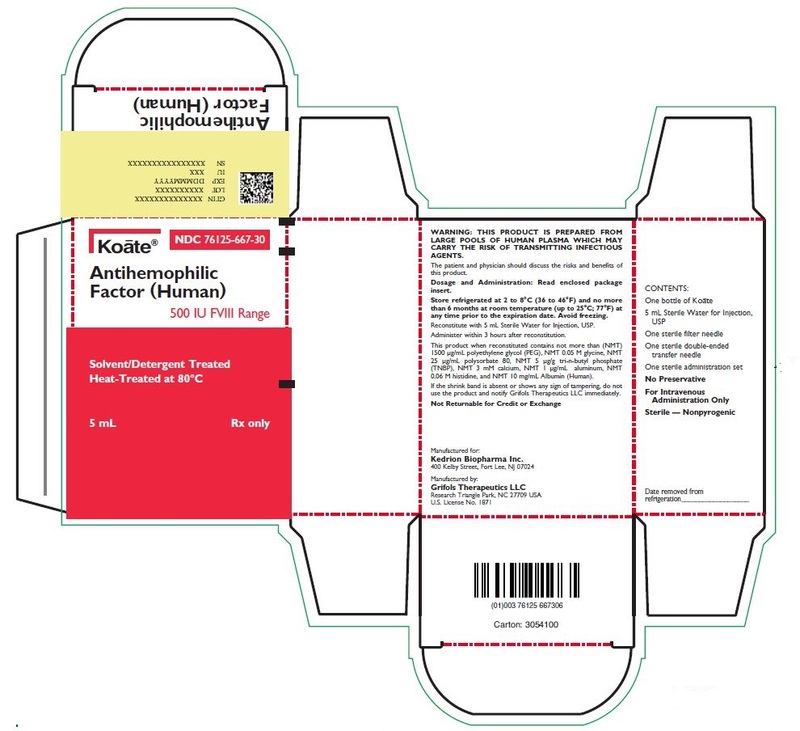 Subjects received 208 infusions of KOÄ€TE for treatment or control of bleeding episodes, including perioperative management, and routine prophylaxis. Children have shorter half-life and lower recovery of Factor VIII than adults. Because clearance of Factor VIII (based on per kilogram body weight) is higher in children, higher or more frequent dosing may be needed. Clinical studies of KOÄ€TE did not include any subjects aged 65 and over to determine whether they respond differently from younger subjects. Individualize dose selection for geriatric patients. KOÄ€TE, Antihemophilic Factor (Human), is a sterile, stable, dried concentrate of human antihemophilic factor in lyophilized powder form for reconstitution for intravenous injection. The product is supplied in single-use vials containing nominally 250, 500, or 1,000 international units (IU or units). Each vial of KOÄ€TE is labeled with the actual amount of Factor VIII expressed in IU. One IU is defined by the current World Health Organization International Standard for Factor VIII concentrate, which can be traced to the level of Factor VIII found in 1 mL of fresh pooled human plasma. The final product when reconstituted as directed contains not more than (NMT) 1500 Î¼g/mL polyethylene glycol (PEG), NMT 0.05 M glycine, NMT 25 Î¼g/mL polysorbate 80, NMT 5 Î¼g/g tri-n-butyl phosphate (TNBP), NMT 3 mM calcium, NMT 1 Î¼g/mL aluminum, NMT 0.06 M histidine, and NMT 10 mg/mL human albumin. KOÄ€TE is purified from the cold insoluble fraction of pooled human plasma; the manufacturing process includes solvent/detergent (TNBP and polysorbate 80) treatment and heat treatment of the lyophilized final container. A gel permeation chromatography step serves the dual purpose of reducing the amount of TNBP and polysorbate 80 as well as increasing the purity of the Factor VIII in KOÄ€TE to 300 to 1,000 times over whole plasma. When reconstituted as directed, KOÄ€TE contains approximately 50 to 150 times as much Factor VIII as an equal volume of fresh plasma. The specific activity after addition of human albumin is in the range of 9 to 22 units/mg protein. KOÄ€TE also contains naturally occurring von Willebrand factor, which is co-purified as part of the manufacturing process. The KOÄ€TE manufacturing process includes two dedicated steps with virus inactivation capacity. The solvent/detergent treatment step has the capacity to inactivate enveloped viruses (such as HIV, HCV, HBV, and WNV). Heat treatment at 80ºC for 72 hours has the capacity to inactivate enveloped viruses (such as HIV and HCV) as well as nonâ€‘enveloped viruses (such as HAV and B19V). The polyethylene glycol (PEG) precipitation/depth filtration step has the capacity to remove both enveloped and nonâ€‘enveloped viruses. The accumulated virus reduction factors for KOÄ€TE manufacturing process are presented in Table 2. Additionally, the manufacturing process was investigated for its capacity to decrease the infectivity of an experimental agent of transmissible spongiform encephalopathy (TSE), considered a model for the variant Creutzfeldt-Jakob disease (vCJD) and Creutzfeldt-Jakob disease (CJD) agents. The manufacturing process has been shown to decrease TSE infectivity of that experimental model agent (a total of 5.1 log10 reduction), providing reasonable assurance that low levels of vCJD/CJD agent infectivity, if present in the starting material, would be removed. KOÄ€TE temporarily replaces the missing clotting Factor VIII that is needed for effective hemostasis. Hemophilia A is a bleeding disorder characterized by a deficiency of functional coagulation Factor VIII, resulting in a prolonged plasma clotting time as measured by the activated partial thromboplastin time (aPTT) assay. 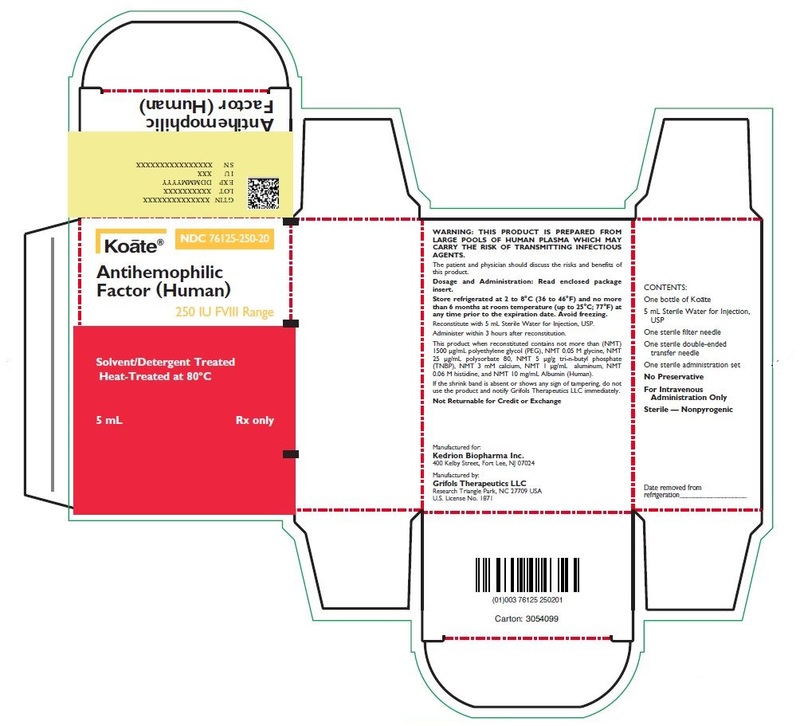 Treatment with KOÄ€TE normalizes the aPTT over the effective dosing period. The pharmacokinetics (PK) of KOÄ€TE were evaluated in a prospective, two-stage clinical trial of 20 previously treated patients (PTPs) with severe hemophilia A. In Stage I, the PK parameters for 19 subjects were based on plasma Factor VIII activity after a single intravenous infusion of 50 IU/kg of KOÄ€TE. Bioequivalence of the dry heat-treated KOÄ€TE to the unheated KOÄ€TE was demonstrated by comparison of Cmax and the area under the curve, AUC0-48 (Table 3). The incremental in vivo recovery ten minutes after infusion of dry heat-treated KOÄ€TE was 1.90% unit/kg (unheated KOÄ€TE was 1.82% units/kg). Mean biologic half-life was 16.1 hours. In Stage II of the study, participants received KOÄ€TE treatments for six months on home therapy with a median of 52 days (range 23 to 94 days). At the end of 6 months, the mean AUC0-48 was 1471 ± 237 unit*hour/100 mL, the Cmax was 99 ± 13 unit/100 mL, and the t1/2was 16 ± 3.9 hours. The efficacy of KOÄ€TE for the treatment of bleeding episodes was demonstrated in a 2-stage, safety, PK and efficacy clinical trial. Stage I was a randomized, single-blind, single-dose, crossover, and PK study comparing heat-treated KOÄ€TE with unheated KOÄ€TE. Nineteen subjects were randomized and received a single dose of 50 IU/kg of either heated KOÄ€TE or unheated KOÄ€TE for PK assessment. Stage II was a 6 month open-label safety study conducted at two hemophilia centers. Nineteen subjects received KOÄ€TE, including for on-demand treatment and control of bleeding episodes. The study populations included 15 Caucasians, 3 Hispanic, and 1 Black subject. A total of 306 bleeding episodes were treated, of which 82% were treated with a single infusion of Factor VIII. Srivastava A, Brewer AK, Mauser-Bunschoten EP, et al. Guidelines for the management of hemophilia. Haemophilia 2013;19(1):e1-47. Abildgaard CF. Current concepts in the management of hemophilia. Semin Hematol 1975;12(3):223-32. KOÄ€TE is supplied in single-use vials containing 250, 500 or 1,000 IU of Factor VIII activity, packaged with 5 mL or 10 mL of Sterile Water for Injection, one sterile double-ended transfer needle, one sterile filter needle, and one sterile administration set. The actual amount of KOÄ€TE in IU is stated on each carton and vial label. Components used in the packaging of KOÄ€TE are not made with natural rubber latex. Store KOÄ€TE in its original package to protect it from light. Store the KOÄ€TE package at 2 to 8°C (36 to 46°F). Do not freeze. KOÄ€TE may also be stored at room temperature (up to 25°C or 77°F) for up to 6 months. Use reconstituted KOÄ€TE immediately or within 3 hours of reconstitution. The patient and physician should discuss the risks and benefits of this product. Reconstitute with 5 mL Sterile Water for Injection, USP. Store at 2â€“8°C (36â€“46°F) and no more than 6 months at room temperature (up to 25°C; 77°F) at any time prior to the expiration date. Dosage and Administration: Read package insert. Do not use unless clear. No antimicrobial agent or other substance has been added. Do not use for intravascular injection without making approximately isotonic by addition of suitable solute. Discard unused portion. WARNING: THIS PRODUCT IS PREPARED FROM LARGE POOLS OF HUMAN PLASMA WHICH MAY CARRY THE RISK OF TRANSMITTING INFECTIOUS AGENTS. Dosage and Administration: Read enclosed package insert. Store refrigerated at 2 to 8°C (36 to 46°F) and no more than 6 months at room temperature (up to 25°C; 77°F) at any time prior to the expiration date. Avoid freezing. Administer within 3 hours after reconstitution. This product when reconstituted contains not more than (NMT) 1500 Î¼g/mL polyethylene glycol (PEG), NMT 0.05 M glycine, NMT 25 Î¼g/mL polysorbate 80, NMT 5 Î¼g/g tri-n-butyl phosphate (TNBP), NMT 3 mM calcium, NMT 1 Î¼g/mL aluminum, NMT 0.06 M histidine, and NMT 10 mg/mL Albumin (Human). If the shrink band is absent or shows any sign of tampering, do not use the product and notify Grifols Therapeutics LLC immediately. Reconstitute with 10 mL Sterile Water for Injection, USP.